For many Clas­si­cal Gui­tarists, part of the reper­toire includes works by the Eng­lish musi­cian and com­pos­er, Robert John­son. John­son was a com­pos­er and Lutenist, per­haps most famous for assist­ing Shake­speare in com­pos­ing music for some of his plays. John­son was born in 1582 and died in 1633 in the city of Lon­don. 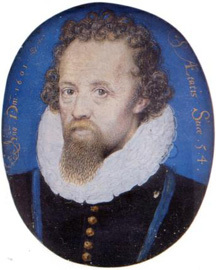 In 1595, John­son entered the ser­vice of Lord Cham­ber­lain, Sir George Carey. This ser­vice offered to the Lord Cham­ber­lain began his rela­tion­ship with impor­tant play­wrights such as William Shake­speare. In 1604, John­son became a Lutenist to the Eng­lish court assist­ing with the pro­duc­tion and com­po­si­tion of music for this court. Over the next twen­ty years, John­son com­posed and pub­lished many dif­fer­ent works of music, all char­ac­ter­is­tic of the Eliz­a­bethan era of music. Johnson’s father, John John­son, had been the Lutenist for Queen Eliz­a­beth. Robert John­son con­tin­ued the tra­di­tion by being appoint­ed as Lutenist for King James I in 1604. Johnson’s music is a good exam­ple of the Eliz­a­bethan music being pro­duced dur­ing this peri­od of Eng­lish his­to­ry and has many beau­ti­ful char­ac­ter­is­tics. The sim­i­lar­i­ties between the Lute and Gui­tar have allowed many of his Lute com­po­si­tions to be played on the gui­tar. The gui­tar stu­dent who plays these pieces will be trans­port­ed back into the roy­al Eng­lish courts with its dis­tinc­tive cul­tur­al and musi­cal inven­tions. The gui­tar stu­dent may start with “Alman” as a good piece to be intro­duced to the dis­tinc­tive and beau­ti­ful music of Robert John­son. Click here for a free score.